Content marketing might not seem important to you, but it is a great way to help local consumers make their way through the purchase process. And, content marketing is an effective way to bring in more leads and even improve your local search ranking. Wondering where to get started? Let’s go! Content marketing means creating content with the intention of educating consumers and clients, driving leads, improving SEO and marketing your local business. That content could be anything from blog posts, videos, infographics, podcasts eBooks and so much more. How Does Content Help With Local Search Marketing? And, content often attracts inbound links, which help improve your local search ranking. How Can You Tailor Your Content Marketing Strategy to Local Search? A big part of content marketing and local search marketing working together will be creating locally focused blog posts. While other forms of content can work for your business, this post will focus on how to write hyper-local blog posts to target a local audience and rank higher in relevant local searches. 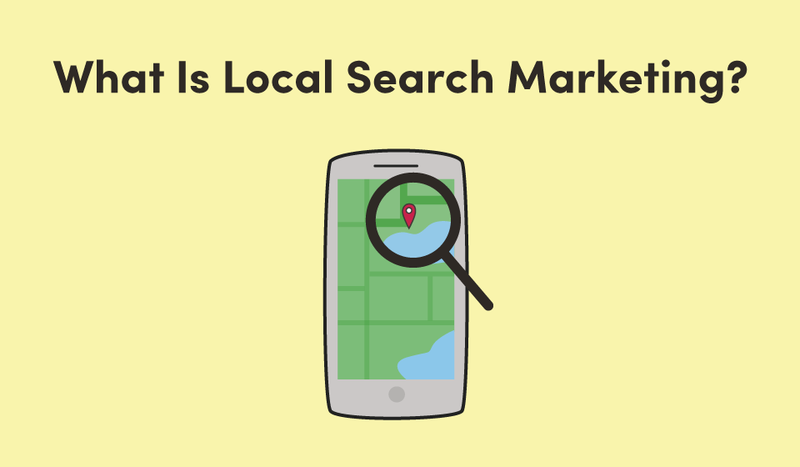 How do search engines rank local businesses in searches? Well, they need to know exactly what you do and where you’re located. One of the ways search engines like Google figure this out is on-page signals. This could be anything from having your business's name, address and phone number visible in the header and/or footer of your website to having location or industry-specific content in blog posts. That means that your blog content, if locally focused, can send signals of local relevance to search engines. Enter your email below to watch our webinar: How to Improve Your Local Search Ranking. The important thing to remember about blog posts is that they should be relevant to your location or industry. Local events are fun to write about, but evergreen content such as a local resource (think a post about your favorite things to do around town or any other local resource that might help residents and tourists in your area) will have a longer lifetime. Evergreen content is more likely to be valuable for longer because events end, making the blog post about the event obsolete. Meanwhile, your evergreen content, if refreshed periodically, will continue to be relevant long after you publish it. Before you write a single post, you need a plan. Here are some things you should consider when deciding on your content strategy. Whether your goal is to get more email subscribers or to drive sales, you need to have a specific, measurable goal. How often can you write and/or publish a new post? If you own a small business, you probably don’t have a ton of time to write blog posts. So, realistically, how often can you write a new post? How will you measure the success of your blog? You’ll need a way to track the success of your blog’s goals. For instance, if your goal is getting more blog traffic, Google Analytics is a great place to start. Who is your audience? You’ll need to have a good idea of your target audience before you start writing so that you know what they actually want to read. Tip: Be specific. Don’t just write to a target audience. Write as if you’re telling your story to a single person. This will help you make sure your posts are specific. Now that you know what you’re going to write about, you can start outlining your post. Outlining what you want to say (even if it’s the most bare-bones outline possible) is the best way to organize your writing. Hubspot has a great article about how to create a blog post outline. Your headline is what hooks the reader. And, 80 percent of people will read your headline while only 20 percent will read your article. That’s why you need to write an intriguing headline that makes your readers want to know more. What kinds of headlines do best with readers? And if you need help with your headlines, check out CoSchedule’s headline analyzer. Not everyone is a writer, but I think everyone can write (with a little guidance). The most important thing to remember here is that your audience has to be able to understand what you're telling them. Write conversationally, avoiding big, scary words and industry jargon. Don't make them work to read your post. And, if you do this, you’ll probably naturally incorporate the SEO keywords that help search engines understand what the blog post is about. Now that you’ve written, give yourself a break. Leave it overnight if possible, or at least focus on something else for 10 minutes. The point of this is to come back to it with a fresh set of eyes. If you’ve just written a blog post, you’re going to remember most of what you typed. But if you give yourself a little time, you will be able to look at it differently. You might not have the budget to pay someone to edit your posts for you, but ask someone (anyone at all) like your significant other, a friend, relative or employee to read the post for you. This person will be able to catch errors you might’ve missed. Seriously, I overlook my typos all the time, and I tend to have three other people read my articles. As for online editing tools, I love Grammarly and Hemingway. Grammarly is a spelling and grammar checker. Hemingway will make sure you’re not using too much technical jargon (or too many long, confusing words and sentences) while writing. So, you published your blog post. Now you need to share it so people will actually know it exists. How do you get it out there for people to see? As a small business owner, you have a lot of responsibilities. I mean, someone has to keep the place running, right? The important thing is to be consistent. Even if you can only publish a post every couple of weeks, that’s fine as long as you don’t fail to publish consistently. Well, some writers do well with writing mostly short-form (fewer than 1,000 words) posts, while others swear by long-form content. So which should you do, long or short form content? For small businesses, it probably isn’t realistic for you to consistently write 2,000+ word posts. However, if you have a lot to say on a particular subject (think an in-depth local guide) you can always chip away at that bit by bit while creating and publishing shorter content. A healthy mix of short and longer blog posts should work for you. And remember, you don't have to write only locally focused blog posts. This type of post should just be a part of your well-rounded social media marketing strategy. Try mixing it up and sprinkling a few local blog posts in with your industry-specific or business-specific posts. Well, there you have it, your step by step breakdown to creating locally focused content. Now it’s up to you to start writing!